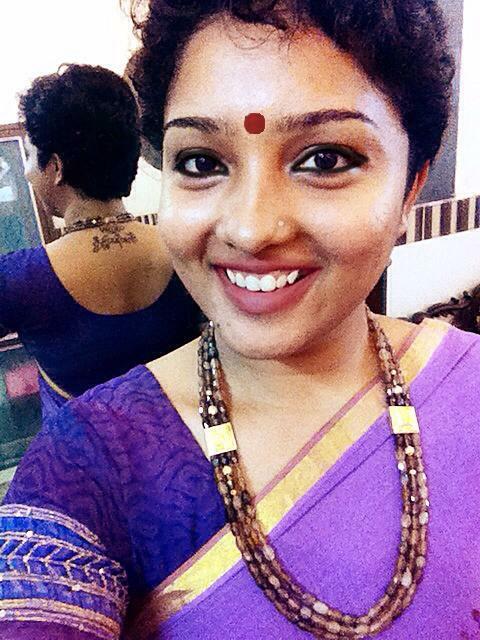 100sareepact | My purple Kasavu Zari! Guess why? My purple Kasavu Zari! Guess why? This saree is a very traditional Kerala Kasavu zari one. It’s supposed to be white or off white. But it’s purple! A few summers ago, my cousins & I went to an exhibition in chennai & spotted this very attractive off-white saree with coloured zari borders & matching block print on it. I bought the one with a maroon accent n my cousin sis bought the one with green. 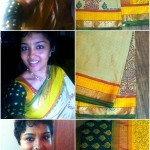 You know how exciting it is to get new sarees and that too matching ones na! Got the blouses ready & wore it to an event together! But thanks to the heat and bad quality block printing…the colours bled…sigh… Oh we both were heart broken & furious. She in fact tried to trace the woman who sold us the sarees & ask her to fix them up somehow…but all her attempts were futile. That woman kinda vanished…like in an episode of the twilight zone! That’s it. These sarees were kept away. Out of sight, out of mind! But recently…as a surprise, Amma got them fixed for us! She has way too much faith in people n things. She doesn’t give up so easily n decided somehow to get them dyed dark enough to conceal the portions where the colour bled-but still not to lose the designs already on them. And she got her dyer to fix the colours well. Unbelievable! Almost like another episode from the twilight zone! Lol! !